HOBSON, Richmond Pearson, a Representative from Alabama; born in Greensboro, Hale County, Ala., August 17, 1870; attended private schools and Southern University; was graduated from the United States Naval Academy in 1889 and from the French National School of Naval Design at Paris in 1893; served in the United States Navy from 1885 until 1903; special representative of the Navy Department to the Buffalo Exposition in 1901 and to the Charleston Exposition in 1901 and 1902; naval architect, author, and lecturer; elected as a Democrat to the Sixtieth and to the three succeeding Congresses (March 4, 1907-March 3, 1915); unsuccessful candidate for nomination in 1916 to the Sixty-fifth Congress; moved to Los Angeles, Calif., and later to New York City; organized the American Alcohol Education Association in 1921 and served as general secretary; organized the International Narcotic Education Association in 1923 and served as president; organized the World Conference on Narcotic Education in 1926 and served as secretary general and as chairman of the board of governors; founder of the World Narcotic Defense Association in 1927, serving as president; awarded the Congressional Medal of Honor in 1933 for sinking the collier Merrimac in 1898; was made a rear admiral by act of Congress in 1934; founder and president of the Constitutional Democracy Association in 1935; died in New York City March 16, 1937; interment in Arlington National Cemetery. 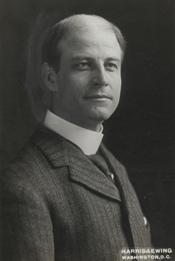 Pittman, Walter E. Navalist and Progressive: The Life of Richmond P. Hobson. Manhattan, KS: MA/AH Publishing, 1981; Rosenfeld, Harvey. Richmond Pearson Hobson: Naval Hero of Magnolia Grove. Las Cruces, NM: Yucca Tree Press, 2000.